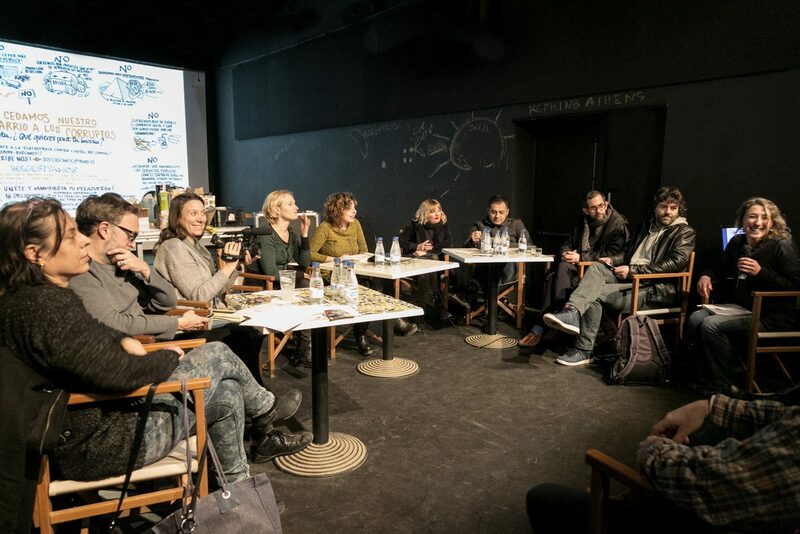 Neighbours, neighbourhood organisation, and local and Greek artists meet to discuss the problems resulting from the gentrification of both Athens and Barcelona, 2015. Antic Teatre – Espai de Creació defends the idea of INDEPENDENT artists and culture. Everything is based on freedom. Three words define what this space is, does, and intends: INDEPENDENCE, SUSTAINABILITY and RESISTANCE. Antic Teatre is INDEPENDENT because it is the result of a citizen initiative motivated by the real needs of a group of artists, as opposed to a something instigated by an administrative body or a political party. The aim is to work from the bottom up and not the other way around. It is INDEPENDENT because creators and collaborators as well as managers and artistic directors have absolute creative freedom, and because we believe that creation should always be critical, politically incorrect and controversial. Artists who work at Antic Teatre are free to create whenever, wherever and however they choose, free from institutions and rules. We base ourselves on responsible self-management in all areas so that “between us and together” we can build a common space for creation. Antic Teatre – Espai de Creació is a PROJECT that aims to be SUSTAINABLE by means of a management model in which Antic Teatre and the artists share responsibility. SUSTAINABLE because we work towards halting the progressive and pernicious disappearance of many independent venues in the city over the past few years, ensuring continuity in our work with artists, the neighbourhood, the audiences and collaborators. Because of this, and given the ever-decreasing assistance available from public institutions, the Antic Teatre community, consisting of the directors, the staff, the artists and our regular collaborators, are constantly looking for new ways of management, of fund raising and new investment possibilities within the community. This is a continuous, open and necessary process to ensure the health and vitality of the project at all levels, above and beyond any potential public funding that may or may not be given. Antic Teatre – Espai de Creació, as well as being free, sustainable and independent, defines itself as a SPACE FOR RESISTANCE in its continued attempt to stay the advance of the neoliberal forces that are looking to turn culture into just another product of the capitalist system. Antic Teatre is a SPACE FOR RESISTANCE because it fights with all the strategies at its disposal to counter the sectorisation of art, which is the basis of the neoliberal project that aims to divide, control and deactivate artistic spaces and artists. To do this, the neoliberal system has put into place the idea that “European creative cities are creation factories acting as engines for the cultural industry”. The reality, however, is that they act as commercial spaces that rent out space to artists so that they can produce. Artists who don’t produce and who don’t make money are of NO INTEREST! The truth is that this is also a perfect excuse for major real estate operations and has little to do with culture and its requirements, or true initiatives of artists.